The status of Jerusalem, home to sites considered holy to Muslims, Jews and Christians, is one of the biggest obstacles to a peace agreement between Israel and the Palestinians. Jerusalem / Gaza: The Islamist group Hamas urged Palestinians on Thursday to abandon peace efforts and launch a new uprising against Israel in response to U.S. President Donald Trump's recognition of Jerusalem as its capital. Palestinian factions called for a "Day of Rage" on Friday, and a wave of protest in the West Bank and Gaza on Thursday brought clashes between Palestinians and Israeli troops. At least 31 people were wounded by Israeli gunfire and rubber bullets, medics said. The Israeli military said an aircraft and a tank had targeted two posts belonging to militants in the Hamas-ruled Gaza Strip after three rockets were launched at Israel. A jihadist Salafi group in Gaza called the Al-Tawheed Brigades - which does not heed the call from the enclave's dominant force, Hamas, to desist from firing rockets - claimed responsibility for the launches. The military said it was reinforcing troops in the occupied West Bank. Some protesters threw rocks at soldiers and others chanted: "Death to America! Death to the fool Trump!" Trump reversed decades of U.S. policy on Wednesday by recognising Jerusalem as the capital of Israel, angering the Arab world and upsetting Western allies. "We should call for and we should work on launching an intifada (Palestinian uprising) in the face of the Zionist enemy," Hamas leader Ismail Haniyeh said in a speech in Gaza. On Friday's "Day of Rage," rallies and protests are expected near Israeli-controlled checkpoints in the West Bank and along the border with Gaza. Friday prayers at the Muslim shrine of Al-Aqsa mosque in Jerusalem could also be a flashpoint. Naser Al-Qidwa, an aide to Western-backed Palestinian President Mahmoud Abbas and senior official in his Fatah party, urged Palestinians to stage peaceful protests. Abbas on Thursday met Jordan's King Abdullah, whose dynasty is the traditional custodian of Jerusalem's holy places. Jordan is a staunch U.S. ally but has dismissed Trump's move as "legally null". Israel considers Jerusalem its eternal and indivisible capital. Palestinians want the capital of an independent state of their own to be in the city's eastern sector, which Israel captured in the 1967 Middle East war and annexed in a move never recognised internationally. No other country has its embassy there. U.S. officials told Reuters that when Trump forewarned the Palestinian president of his intention to recognize Jerusalem as Israel's capital, he assured him that a peace plan being put together would please the Palestinians. Trump's decision has raised doubts about his administration's ability to follow through on the peace effort that his son-in-law and senior adviser, Jared Kushner, has led for months aimed at reviving long-stalled negotiations. Israeli Housing Minister Yoav Gallant said he would next week bring to the Cabinet for approval 14,000 housing units, some 6,000 of which are slated for construction in areas in Arab East Jerusalem and are already at various planning stages. "Following President Trump's historic declaration, I intend to promote and reinforce building in Jerusalem," Gallant said in a statement. Trump said on Wednesday that his administration would begin a process of moving the U.S. Embassy in Tel Aviv to Jerusalem, a step expected to take years and which his predecessors had opted not to take in order to avoid inflaming tensions. Israeli Prime Minister Benjamin Netanyahu hailed Trump's announcement as a "historic landmark" and said many countries would follow the U.S. move and contacts were under way. He did not name the countries. The White House said it was not aware of any other country that planned to follow Trump's lead. "President Trump has immortalised himself in the chronicles of our capital. His name will now be held aloft, alongside other names connected to the glorious history of Jerusalem and of our people," he said in a speech at Israel's Foreign Ministry. Close Western allies of Washington, including France and Britain, have been critical of Trump's move. The EU's foreign policy chief, Federica Mogherini, said Jerusalem must be the capital of both Israel and a future Palestinian state. A senior Palestinian official with Fatah said that U.S. Vice President Mike Pence, due to visit the region later this month, was "unwelcome in Palestine." A spokesman for Pence said the vice president was planning to meet Abbas on the trip. Deputy Palestinian U.N. envoy Feda Abdelhady-Nasser complained to the U.N. Security Council late on Wednesday about Trump's decision. The Security Council is likely to meet on Friday. Haniyeh called on Abbas to withdraw from peacemaking with Israel and on Arabs to boycott the Trump administration. Abbas said on Wednesday the United States had abdicated its role as a mediator in peace efforts. 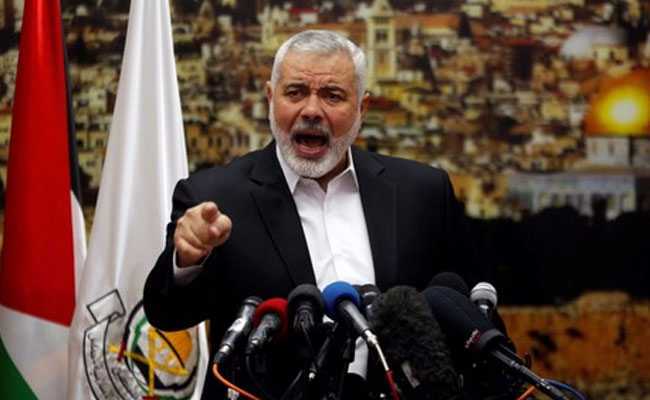 "We have given instruction to all Hamas members and to all its wings to be fully ready for any new instructions or orders that may be given to confront this strategic danger that threatens Jerusalem and threatens Palestine," Haniyeh said. Israel and the United States consider Hamas, which has fought three wars with Israel since 2007, a terrorist organisation. Hamas does not recognise Israel's right to exist and its suicide bombings helped spearhead the last intifada, from 2000 to 2005. Fearing disruption to reconciliation efforts between Hamas and Fatah, Palestinian Prime Minister Rami Al-Hamdallah and other Fatah delegates arrived in Gaza on Thursday to meet Hamas. Trump said his move, which fulfilled a campaign promise, was not intended to tip the scales in favour of Israel and that any deal involving the future of Jerusalem would have to be negotiated by the parties. But the move was seen almost uniformly in Arab capitals as a sharp tilt towards Israel. The United States is asking Israel to temper its response to the announcement because Washington expects a backlash and is weighing the potential threat to U.S. facilities and people, according to a State Department document seen by Reuters. In Lebanon, Hezbollah leader Sayyed Hassan Nasrallah backed calls for a new intafada and said: "We are facing blatant American aggression." Islamist militant group Al Qaeda in the Arabian Peninsula said Trump's decision was the result of "normalisation steps" between some Gulf Arab countries and Israel. Protests have broken out since Trump's announcement in Jordan, outside the U.S. consulate in Istanbul and in Pakistan. Thousands of Tunisians protested in several cities on Thursday.